Not feeling the best right now, no. 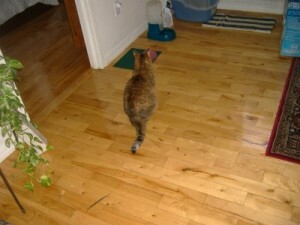 But almost-20 years was a phenomenal run for a cat, and she felt no pain at the end. We should all be so lucky. I miss you, li’l cat, silly bat, Nunuku susuku bubuku. But wherever you are, give the mice there hell. ETA Fixed the date. Wishful thinking there. So sorry to hear this! its always hard to lose a pet especially when the’ve been with us for so long. My thoughts are with you and Nunuku. Really sorry to hear that. My family lost our longtime cat a few years ago and no matter how old she was for a cat (18 in her case, not a bad stretch either) it never feels like it was enough, or that you’re ready for the end. But it sounds like Nunuku was in very good hands with you and lived a fine life indeed, and that’s definitely something to be proud of. I’m so sorry to hear about NukuNuku. Sorry to hear about the passing of your pet. As others above, I’ve been there with my pets in the past. It was rough when the dog (Sammie) I had in college passed away (far, far, far too young; it was a tragic death, and not a peaceful one). I am so sorry. There’s line about the space an absent cat takes up. This isn’t it, but it’s close. My sincerest condolences. Wherever we place our affection, if it is returned, it is not wasted. I wish you swift healing and many fond memories.